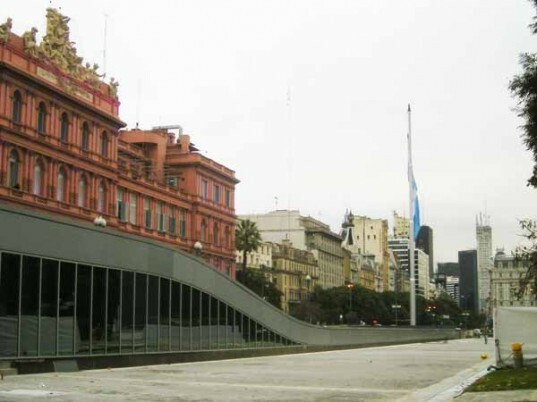 Recently unveiled by Argentine president Cristina Fernandez de Kirchner, the grand and gorgeous Museo del Bicentenario is an unexpected historic site hidden deep beneath Buenos Aires’ pink Government House. Opened last month as part of the Argentina’s celebration of independence from Spain in 1810, the museum stands ten meters below street level. Click through our exclusive images for a first-hand look inside one of Buenos Aires’ most well-kept treasures. The Museo del Bicentenario blends history and modern technology in an elegant and conscientious way, deep under Buenos Aires’ Pink Governmental House. Its 54,000 square foot galleries stretch in and out of a bright and wide patio area and a beautifully-restored building. The museum is settled within the city’s former fort structure, once used from 1580 until 1855 when it was then transformed into the site for Taylor Customs welcoming people and goods in from the Old World. From 1957 on, the structure served as the Governmental Pink House Museum, and now the building is the newly restored Museo del Bicentenario. Designed by a group of engineers, architects, restoration specialists and the Federal Planning and Public Investment Ministry, many original features like old wooden beams that come out from the pink stone walls reminds visitors and the museum staff the importance of working with long-lasting sustainable materials, which at the same time, touch on the romance of the historic site. As soon as one enters the building, descending the stairs to the lower levels, they are immediately met with a naturally-lit patio area that opens up to unveil red brick ruins mixed with contemporary Argentine art. A highlight in the collection — protected inside a glass cube — is an emblematic wall painting by Mexican artist David Alfaro Sequeiros. Soldiers and information spots are located throughout the galleries and are there to educate visitors on the important historical moments of Argentina. Many found objects like pieces of broken British pottery, glass and animal bones are exhibited in chronological order and now glow under bright LED lights. Old buildings parts, some of them dating back to the beginning of the 18th century, reveal enchanting stories from the past. While walking through the swirling underground galleries, visitors can begin to understand Argentina’s history through a wide variety of mediums. Past presidents’ personal objects, films and paintings help to tell the story of a country that has been through a tumultuous past. The contrast between the variety of exhibition mediums, contrasting with the old brick structures and soft lighting, is what makes Museo del Bicentenario a hidden underground treasure. A painting of Buenos Aires ‘inaugural act’ by Spanish conquistador Juan de Garay illustrates the history in paint. By law everybody had to attend to a city’s opening, but the picture shows how natives didn’t understand what was going on. Another relic, a wooden post from the old port still stands at the museum’s patio. At the end of the wide patio area is the museum’s café, with tables that make the most of the natural light coming in from the glass roof and a bar serving drinks inside a tunnel. There is also space for a brightly colored modern painting of a battle by Luis Felipe Noe, which hangs from the wall, wedged between pieces of architectural history. The Museo del Bicentenario is ten meters below street level and has the ability to spark the imagination of anyone curious as to how Buenos Aires used to be. 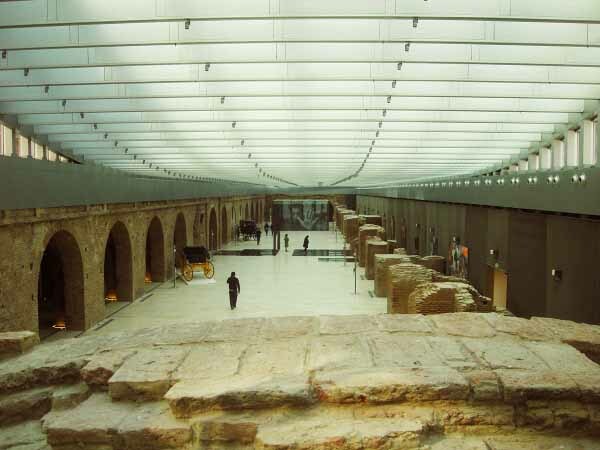 The use of natural light from the glass roof, the atmospheric LED lightning within the galleries, and the latest technology for controlling humidity and temperature makes for a fantastic contrast between the old and the new. The use of mixed-media to tell the story of Argentina gives visitors a complete picture and presses them to make their own investigations by reading the history embedded in the objects on display, old walls, photographs and modern paintings. Because it is not only the historians that write history, but also the people. Located deep under Buenos Aires’ Pink Governmental House, the Museo del Bicentenario blends history and modern technology in an elegant and conscientious way. Its 54,000 square foot galleries coming in and out from the bright and wide patio area are the results of beautifully restored existing building structures. The museum is based where the city’s Fort used to be back in 1580; in 1855 it was the site for Taylor Customs; and since 1957 as the Governmental Pink House Museum, now restored into Museo del Bicentenario. Designed by a group of engineers, architects, restoration specialists and the Federal Planning and Public Investment Ministry who found previously uncovered structures like the brick arch at the bottom of the stairs while doing architectural and archaeological renovations. Many original features like old wooden beams that come out from the pink stone walls reminds visitors and staff of the importance of working with long-lasting sustainable materials, which at the same time, add a touch of romance to the site. As soon as we enter the building and go down the stairs, the naturally-lit major patio area opens up unveiling red brick ruins mixed with contemporary Argentine art. Immerse and protected inside a glass cube at the back is an emblematic wall painting by Mexican artist David Alfaro Sequeiros. Soldiers and interactive information spots are always accessible to visitors, enabling guests to get a better grasp of the important historical moments in Argentina. Many found objects like pieces of broken British pottery, glass and animal bones are exhibited in chronological order, and now glow under bright LED lights. Old buildings parts, some of them dating back to the beginning of the 18th century, reveal enchanting stories from the past. 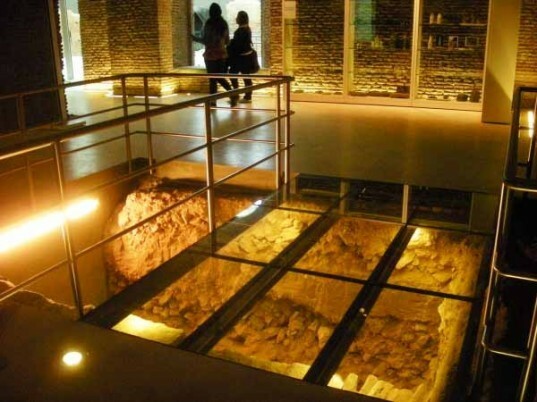 While walking through the swirling underground galleries, visitors can get a grasp of Argentina's history through a wide variety of mediums. Past president's personal objects, films and paintings help telling the story of a country that has been through a lot. The contrast between the variety of exhibition mediums contrasting with the old brick structures and soft lighting is what makes Museo del Bicentenario a hidden underground treasure. A painting of Buenos Aires ‘inaugural act’ by Spanish conquistador Juan de Garay illustrates the incredible history. By law everybody had to attend to a city's opening, but the picture shows how natives didn't understand what was going on. A wooden post from the old port still stands at the Museum’s patio. At the end of the wide patio area is the museum's café, set with tables that make the most of the natural light coming in from the glass roof. A bar also serves drinks inside a tunnel. There is also space for a bright colored modern art like a painting of a battle by Luis Felipe Noe that hangs from the wall in between pieces of history. The Museo del Bicentenario is ten meters under floor level and sparks the imagination to how the city used to be. 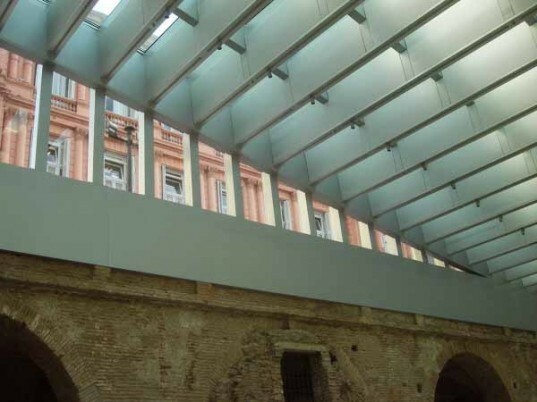 The use of natural light from the glass roof, the atmospheric LED lightning within the galleries and the latest technology for controlling humidity and temperature makes for a fantastic contrast between the old and the new. 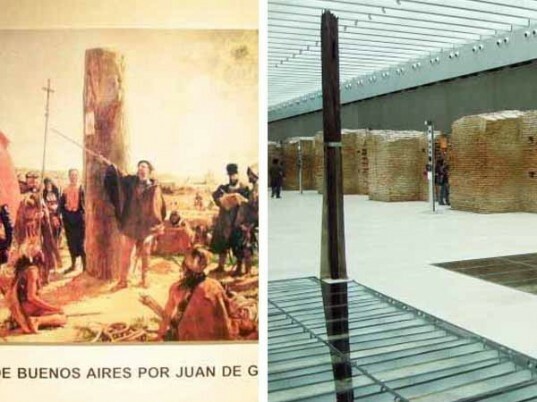 The use of mixed-media to tell the story of Argentina is designed so visitors could complete the picture and make their own interpretations by reading the messages embedded in those personal objects, old walls, photographs and modern paintings, because is not only the historians that write history, but also the people.